After our trip through northern New Mexico with Eric’s parents, we split from them and headed back towards home. We decided to make a scenic trip out of it, and add a few more of the sites in southern Colorado to our trip, including another UNESCO World Heritage site and one of our favorite national parks. 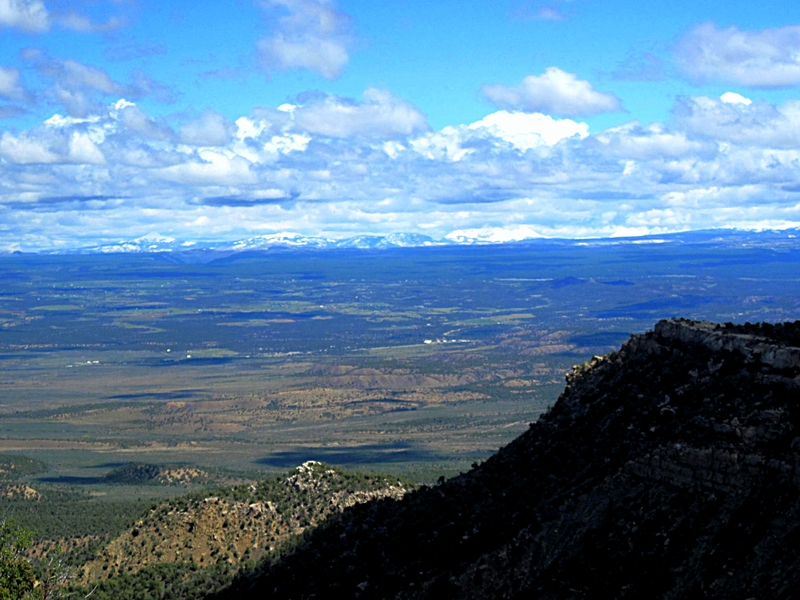 After leaving Chaco Canyon, we drove north out of New Mexico to the southwestern Colorado city of Durango. We hadn’t pre-booked a place to stay, but had identified a road on the north side of downtown with a few cheaper off-brand hotels. The first one we tried had no one at the front desk and the door locked (which seemed strange), so we went a little further down the street to the Day’s End Motel. It was a little run down, but we did have a decent room that would work well for our purposes. For dinner, we decided just to do something close rather than head to downtown. On Yelp, we found a Mexican restaurant called Tacos Nayarit within walking distance. 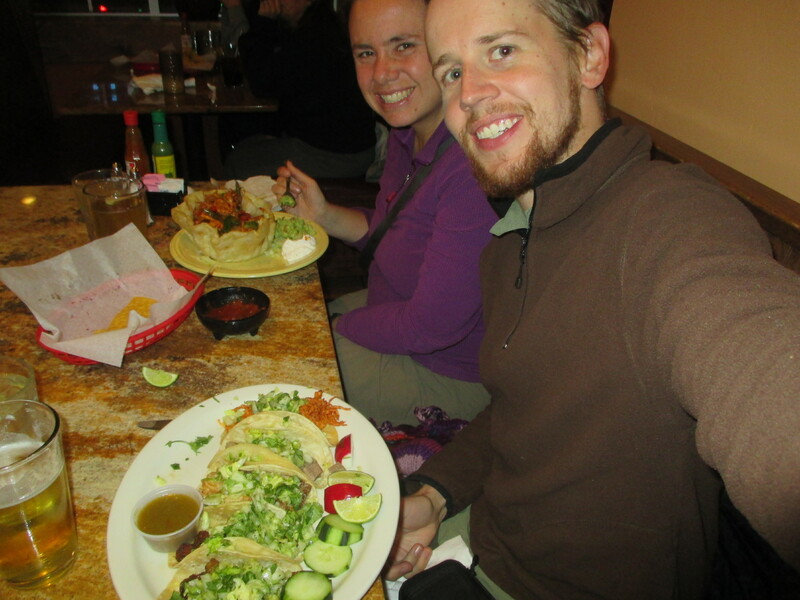 We enjoyed the food, especially the cheap tacos which were their specialty. The next morning we headed out for a day trip to Mesa Verde National Park, our third UNESCO World Heritage site of this roadtrip. It is mainly known for its intricate cliff dwellings set high up on the walls of picturesque canyons. Our first stop was the recently renovated visitor center, where we picked up some maps and a few self-guided trail brochures. We also signed up for a ranger-led tour of the Balcony House (you have to register in advance for these tours since space is limited). We paused a few times on the drive into the main part of the park to take in the scenic views out over the valley below. We had a little time before our tour, so we did the self-guided walk through the Spruce Tree House ruins. 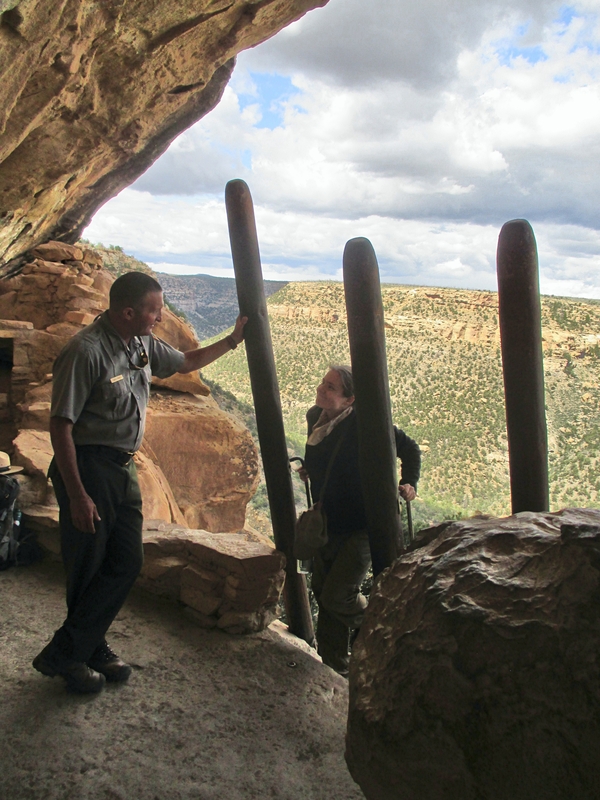 Here we got our first look at one of the famous cliff-dwellings built by the Ancient Puebloans. This is the same general culture that built the structures at Chaco Canyon, but archaeologists are still debating the exact relationship between the two. The cliff dwellings were built after the great houses in Chaco Canyon were abandoned, so one theory is that the builders came to Mesa Verde and built there, but there are not very many architectural similarities, so it’s not clear that it would have been the same people. After a brief stop in the museum and a picnic lunch, we headed to the trailhead for the Balcony House guided tour. The ranger who led the program was very interesting and quite informative. He had grown up in the area so he was able to explain a lot about what we were seeing. A lot of the beginning of the hike was taken up with him giving a safety briefing for accessing the ruins, since the ruins are found in the side of a steep cliff face, requiring a bit of an adventure to get in and out of. The ranger also explained something that we had found confusing: why the people who built Mesa Verde were now called Ancestral Puebloan. 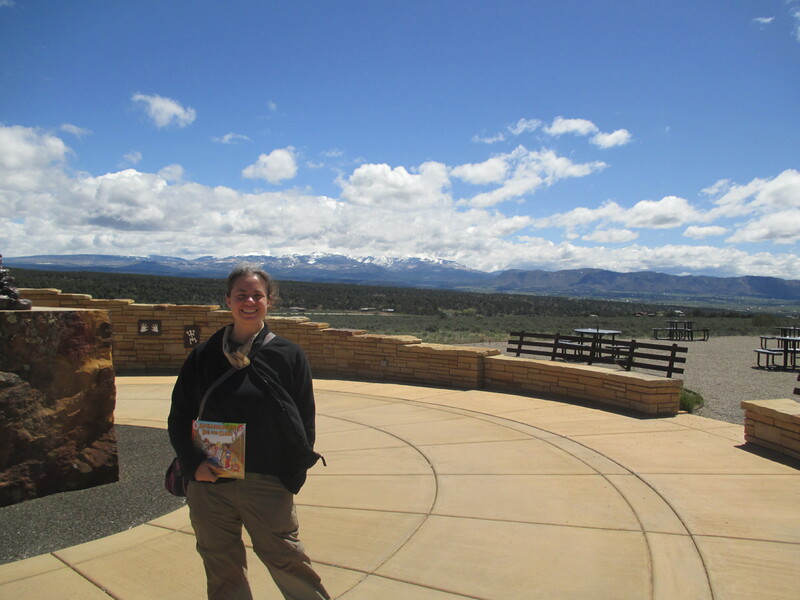 The two of us had both visited Mesa Verde as children, and remembered the park literature then referring to the Anasazi people. As it turns out, this was a phrase that had been invented by historians, and the modern-day descendants found it offensive. The term Ancestral Puebloan was deemed to more accurately reflect who these mysterious ancestors were. The first “obstacle” was a large ladder, which turned out to be pretty fun to climb. The ruins themselves were actually a little small, and it felt like we had to rush through them, since it took a while for the large group to all get up the ladder. After a brief tour of the ruins, we crawled out through a narrow tunnel (smaller than the Cu Chi tunnels in Vietnam), up another ladder, and then along some stairs. It was a little nerve-wracking but also pretty fun. 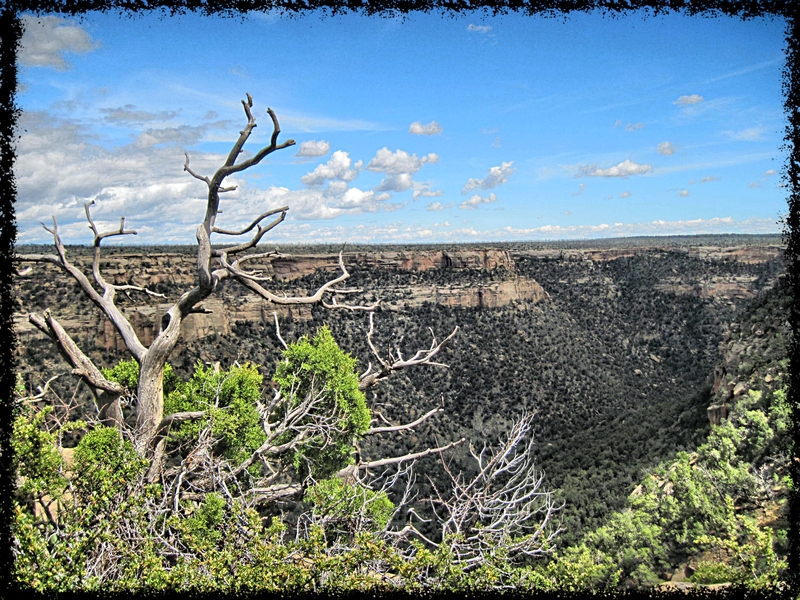 Our next activity was a self-guided drive along the sites of the Mesa Top Loop. Here were got to see some of the ruins of other types of structures found in the park. Most people only know about the cliff dwellings of Mesa Verde, but those were actually built later in the area’s history. The early settlements were more traditional farming villages, with small buildings and the ceremonial kivas which are the hallmark of the Ancestral Puebloan culture. We could see the progression of building technology as the years went on, culminating in the big cliff houses. Historians are still unclear what drove the culture into such an isolated location. Was it for defensive purposes from some outside threat? They don’t know for sure. Our last stop was the Far View sites, a collection of buildings making up a small village on top of the Mesa. Here we found some of the larger buildings that reminded us a bit of the great houses in Chaco Canyon. The most impressive ruin here was an ancient reservoir that was used as a water supply for the village. The drive out of the park was pretty, with the sun starting to set over the mesa and valleys below. 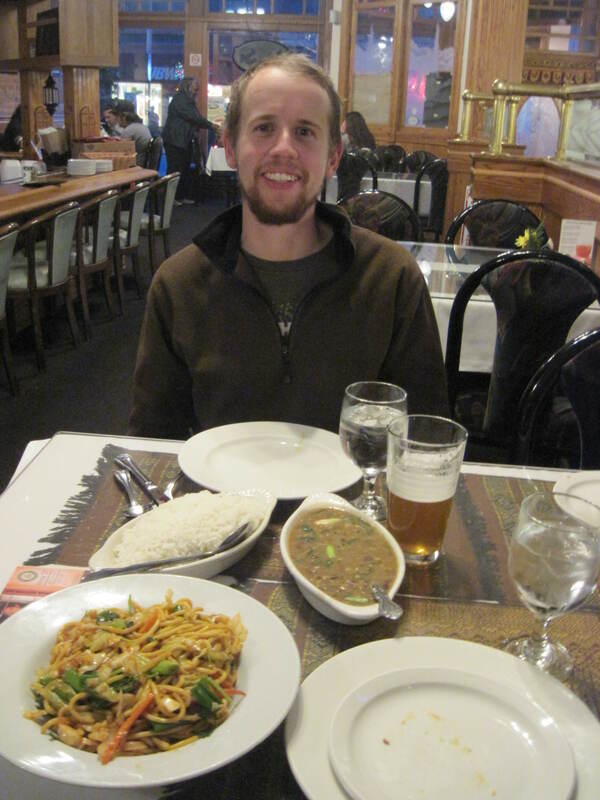 We stopped in downtown Durango and decided to eat at a Nepali restaurant we had seen earlier. We felt it was fitting to go there after our recent earthquake experience. We didn’t tell anyone we had been in the country, since we didn’t really know how to. We donated a little money to a collection that they had set up for relief efforts. The next morning we packed up and headed east. We took a slight detour to Vallecito Lake, where we drove around and took some pictures. This was for the benefit of Eric’s dad, who has fond memories of the summers he spent there at a camp run by his uncle. The camp is a RV park now, but you can still see some traces of the old buildings. We drove on to the town of Pagosa Springs, where we stopped for lunch and then an afternoon of lounging in their signature attraction, the natural mineral hot springs. There are a few options of different places to experience the springs. The town visitor center had a nice brochure comparing the costs and benefits. We chose the Overlook Hot Springs, a cheaper spa housed in an old Victorian mansion on the main street. As it turned out, for most of our time there we had the whole place to ourselves! We started at the outdoor tubs on the roof, but the intense sun drove us inside. Here we lounged for a long time in the dimly lit main room, alternating between some of the hot mineral pools in there (and occasionally a cold plunge pool!). It was very relaxing, but we finally, reluctantly got out of the pools, showered off, and headed east once more. Our destination that night was the town of Alamosa. Once again, we hadn’t booked anything ahead, but we did identify one cheaper place just outside downtown, the Riverside Inn. We were lucky and got the last available room for the night. We were also surprised – the room was large! 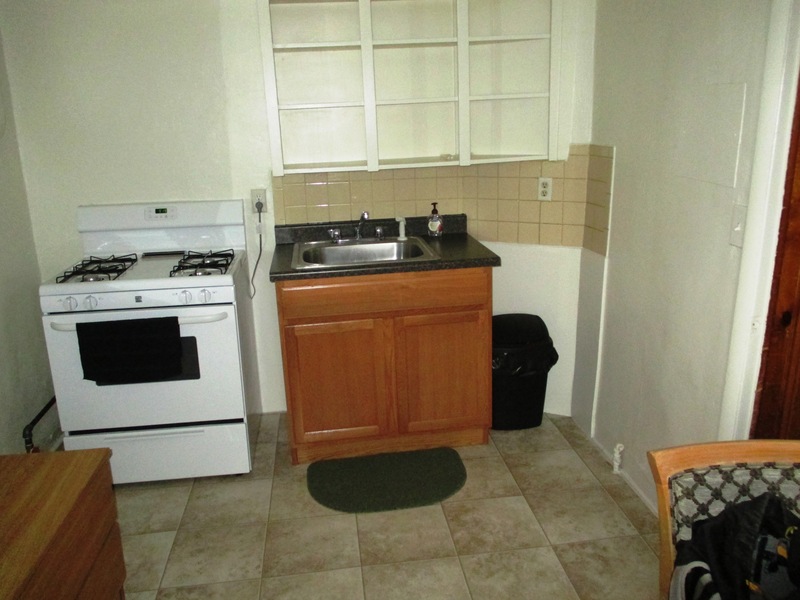 We weren’t expecting to have a separate room with a full oven, refrigerator and dining area. We hadn’t prepared to cook on our own, so we headed in to town to find some dinner. Like any respectable Colorado town, Alamosa has a microbrewery restaurant, San Luis Valley Brewing Company. We love beer, so we made this our dinner stop for the night. 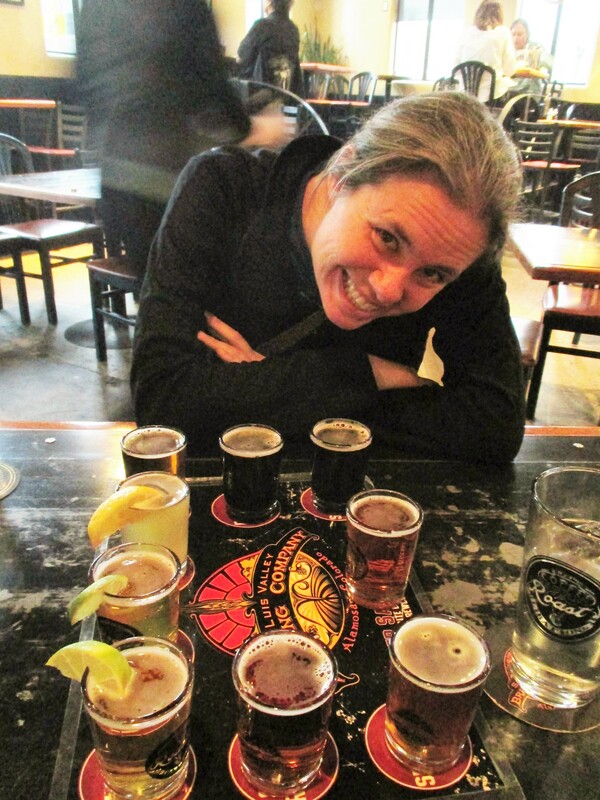 We shared a taster tray of their brews, including some interesting ones made with green chile. The food was pretty good as well. The next morning we headed out to a park which Della has great memories of as a child: the Great Sand Dunes. It was overcast though, and as we drove out, it started to rain :(. We stopped in the Visitor Center and browsed their exhibits while we waited for it to clear up. Eventually it only started drizzle, so we went out to explore the dunes. Unlike other parks, there aren’t many rules about where you can go for a hike. You kind of just set out and hike wherever you want on the sand – the wind will erase your tracks before you know it! In the spring and early summer, there is one small obstacle you must cross – a seasonal river of snowmelt runs between the parking area and the base of the dunes. There are no bridges across it, so you have to figure out your own way across. On a hot summer day, it might be fun to splash across, but this was a cloudy, cold, late spring day, so we spent a while debating our options. It was too deep to think that we could make it across in our waterproof hiking shoes, so we decided to wear sandals and just get wet. This was complicated by the fact that the creek exhibits an interesting phenomenon called “surge flow,” which means that there are waves of water surging down the creek. We tried to time our spurts of activity around surges, but they were pretty frequent and we still got pretty wet. Our feet were numb from the cold water by the time we got over. In retrospect we wished we had brought dry shoes and socks to change into on the other side. Instead, we just explored the dunes in our wet sandals. It was windy and starting to rain again, so we didn’t go very far. We walked up one dune, took in the view, and then headed down again once it started to hail/sleet. It was a disappointing visit to the dunes :-/. Though even with the bad weather, we managed to have some fun! We ran back across the creek, and hurried to the car where we tried to warm our feet back up. Once they started to thaw, we hit the road and drove back to Denver. Our unplanned roadtrip through northern New Mexico and southern Colorado was a success. We got to see three UNESCO World Heritage sites, a lot of natural beauty, spend some time with family, and do a little mental recovery from the abrupt end of our trip in Nepal. We weren’t quite ready to end our travels, so it was nice to do a little bit more traveling in our own backyard. ← What Were the Most/Least Expensive Places to Travel Per Day?